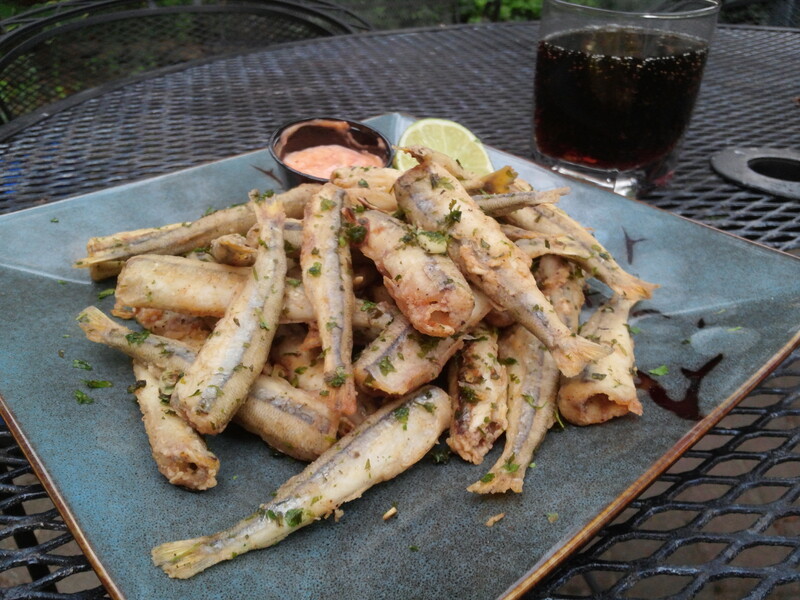 Fried smelts, tossed with garlic and cilantro leaf and served with fresh lime and sriracha mayo. I remember my dad picking up fried smelts from a takeout place when I was a child in Indiana. They were interesting to me since you eat the whole fish: bones and all. 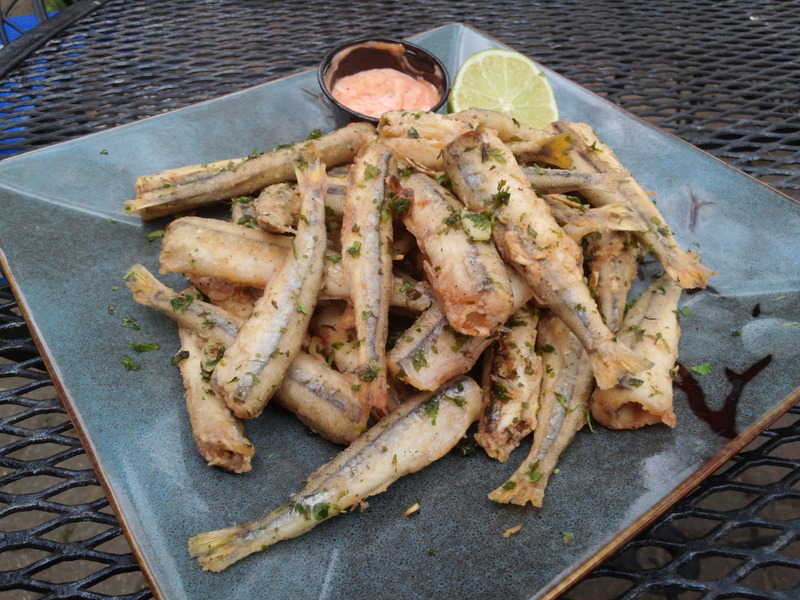 Most recently I was reminded of smelts when they were served last fall at my favorite brew pub, Cambridge Brewing Company, where the chef does lots of great specials. Anyway, here is how I prepared them. 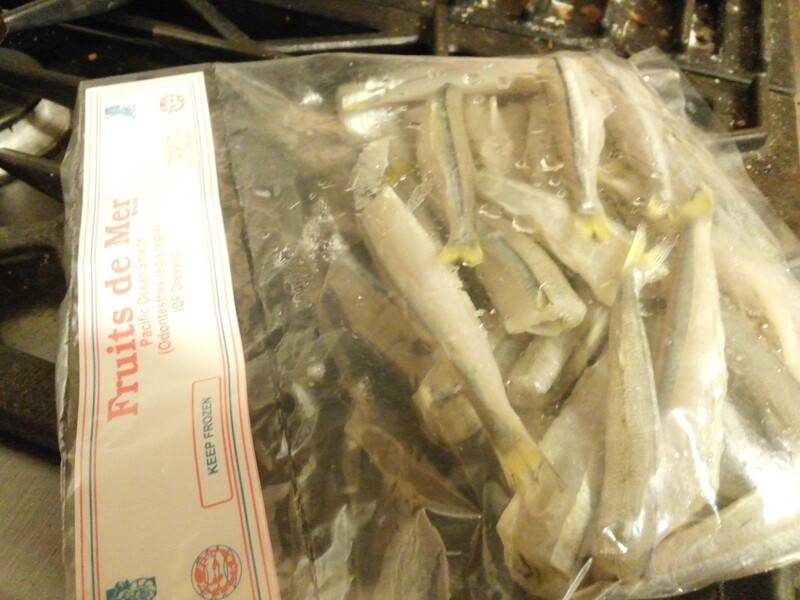 A pound of smelts (perhaps 35 here?) is likely enough for two as a main course and for four as an appetizer. 1 pound of smelts, thawed from frozen. Peppers, salt, and mexican oregano to season the flour; mayonnaise and pepper sauce for dipping; and olive oil, cilantro, and garlic to be sautéed and tossed with the fried smelts. 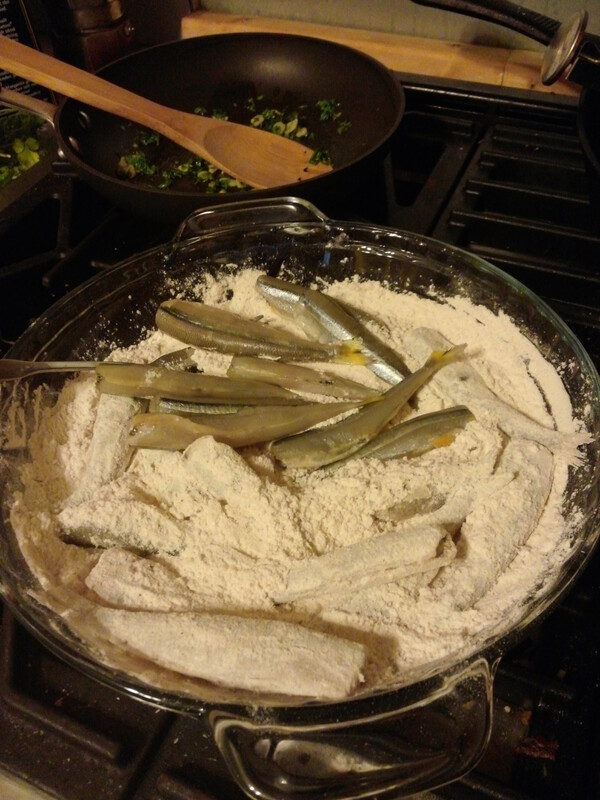 Coat the moist smelts with flour seasoned with smoked paprika, cayenne, crushed mexican oregano, salt, and pepper. Fry the coated smelts perhaps 4 minutes in oil (at ~320° F). While frying the fish, prepare some ligltly sautéed fresh herbs with which to toss them. 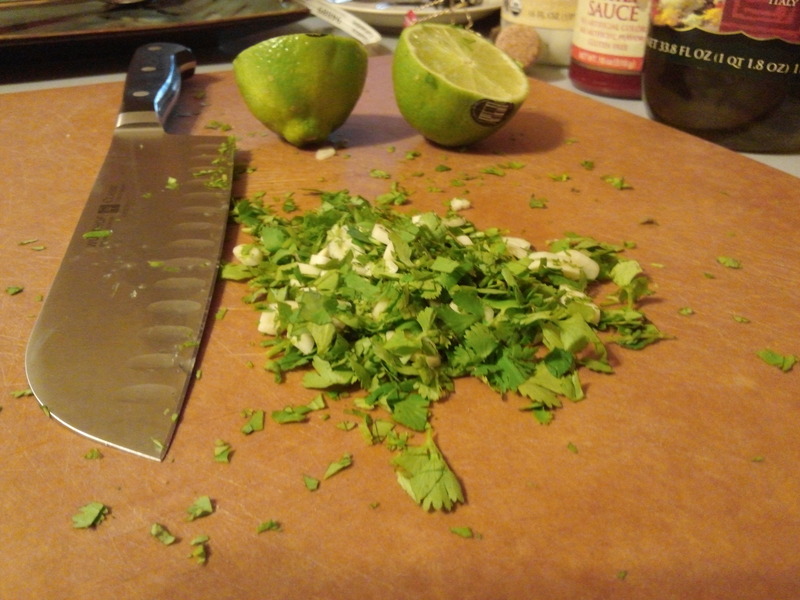 Chopped cilantro leaf and sliced garlic. 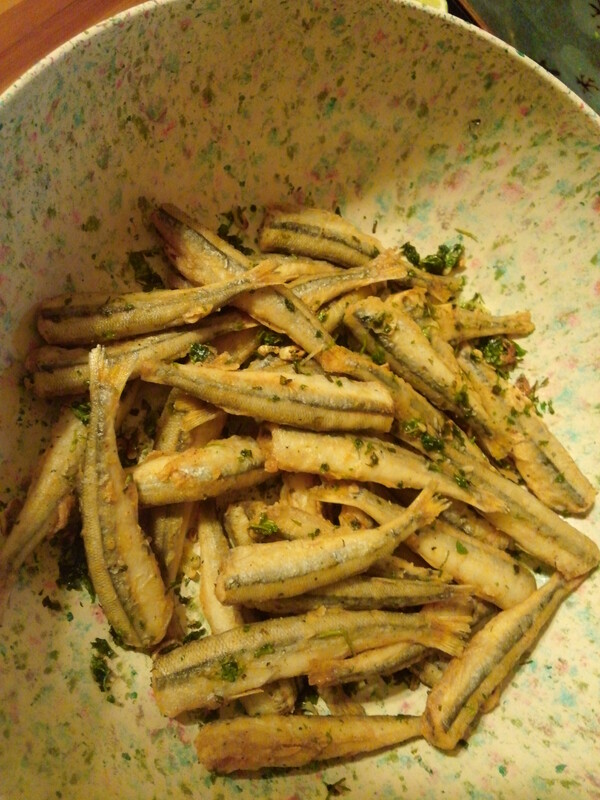 Toss the fried smelts with cilantro and garlic, sautéed in olive oil. I squeezed some fresh lime over the fish and served them with a dipping sauce of mayonnaise and sriracha sauce, on a beautiful first-day-of-summer in the backyard! 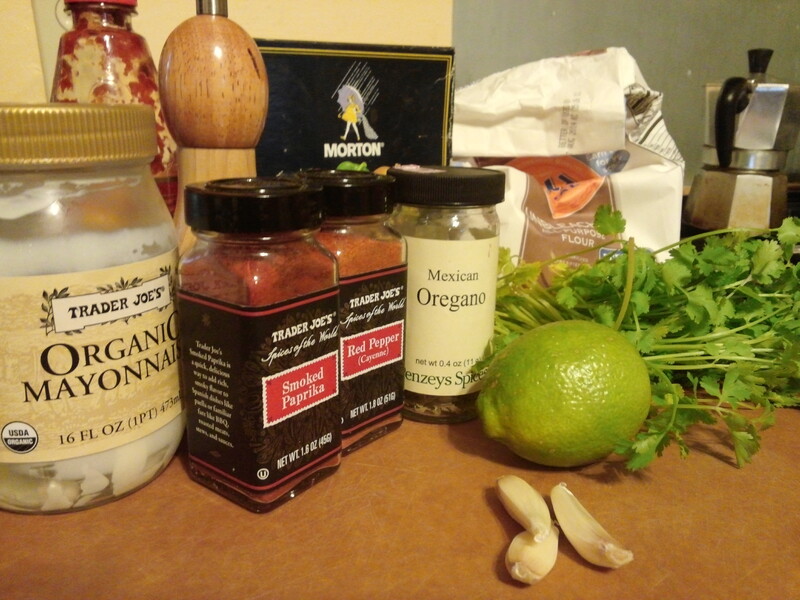 I had these all to myself, so I have some left-overs; I picked up some napa cabbage today, planning to use the rest for fish tacos on corn tortillas. I made these on our first day of summer; if I remember correctly, you must just starting wintertime. Happy solstice! Yep. It’s getting nice and chilly down here at the mo’. Ha, I see you just did sardines – nice! My father would fry these for us on weekends in California. Love them! 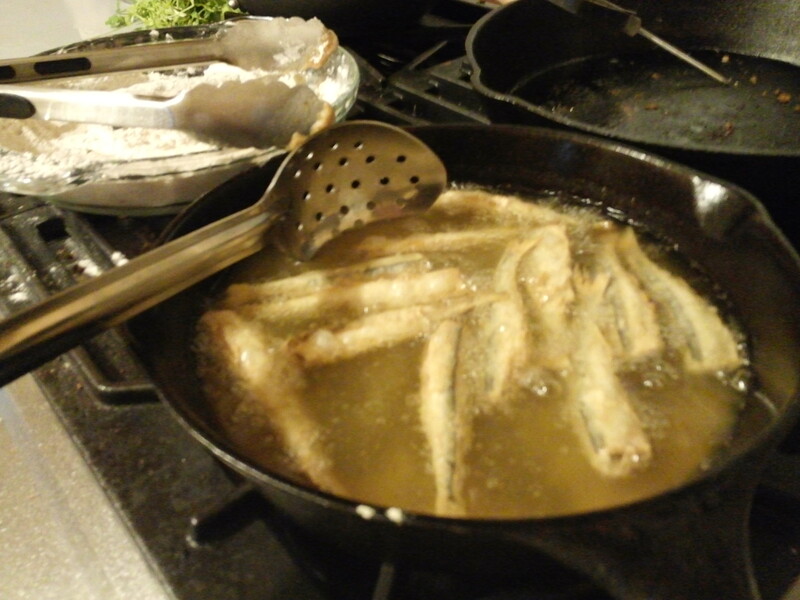 I had a grandmother that would make smelt once in a while (beer batter). Also as a child (Northern Illinois) the family would go out when smelt were in season to various VFW’s for Friday night smelt frys. I need to try making smelts using my bacon grease !! Hi Matthew, we were in adjacent states at the same time then. The bacon grease is just so salty though!